My Family Fun - Deluxe Standing Easel Essential for youg kids development! Essential for youg kids development! The smart design of Melissa and Doug's Deluxe Standing Easel will remind you again and again, "This easel was a great purchase!" ...Your budding artist will be inspired by free-form drawing and creative play at this imagination-building little work station. 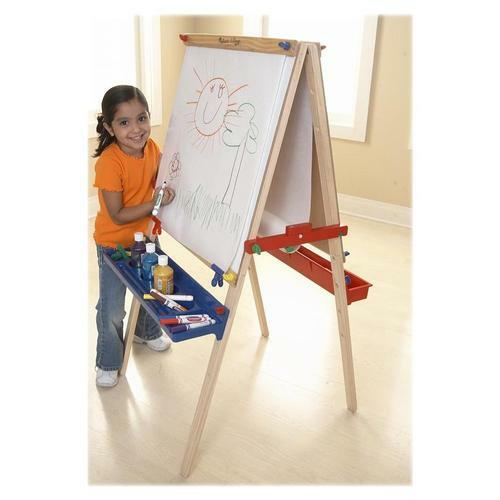 The versatile design and tasteful, colorful, high-quality construction of this child's easel makes it a customer favorite. Generously sized, offering a dry erase board on one side, a chalkboard on the other...an easy-loading holder for easel board paper (see center of easel in photograph) and a paper cutter. For all those essential artist supplies you'll find two extra large plastic trays ideal for holding chalk, crayons, markers, brushes, paint and other artist tools. This standing easel also includes 4 colorful clips for posting artwork. 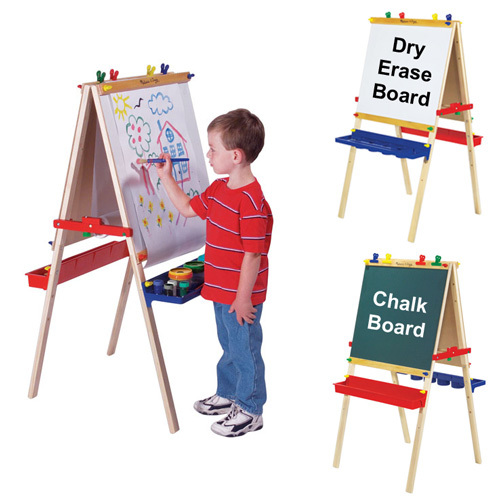 Recommended for kids aged four and older, this easel is designed to be the perfect height for little artists. Folds for easy storage. Instructions included for easy assembly.